Anne of Cleves was born 22nd September 1515 in Düsseldorf to John III, Duke of Cleves and his wife Maria, Duchess of Julich-Berg. Anne grew up on the edge of Solingen. At the age of 11 in 1527 Anne was betrothed to Francis, the 10 year old son of the Duke of Lorraine. Due to his age in 1535 the betrothal was broken off and considered unofficial. Anne’s brother succeeded his father as the Duke of Cleves and due to his support of the Reformation and his ongoing dispute with the Holy Roman Emperor, Cleves was considered by Thomas Cromwell as a convenient ally. Following the death of his third wife, Jane Seymour, King Henry VIII was beginning to consider remarrying for the fourth time and began to seek out his options. Hans Holbein the Younger was sent to Cleves to paint both Anne and her younger sister, Amalia, Henry was considering either of the sisters as his wife. Holbein was instructed to be as accurate as possible in his painting and not to flatter the sisters. The paintings were brought back to Henry who chose Anne based on her portrait. Negotiators were sent to Cleves to begin talks regarding a marriage between Anne and Henry. Thomas Cromwell oversaw the talks himself and a marriage treaty was signed on 4th October 1539. With the treaty signed Anne set off for England. “This year on St John’s Day, 27 Dec, Lady Anne, daughter of the Duke of Cleves in Germany, landed at Dover at 5 o’clock at night, and there was honourably received by the Duke of Suffolk and other great lords, and so lodged in the castle. And on the following Monday she rode to Canterbury where she was honourably received by the Archbishop of Canterbury and other great men, and lodged at the King’s palace at St Austin’s, and there highly feasted. On Tuesday she came to Sittingbourne. On New Year’s Eve the Duke of Norfolk with other knights and the barons of the exchequer received her grace on the heath, two miles beyond Rochester; and so brought her to the abbey of Rochester where she stayed that night and all New Years Day. And on New Years Day in the afternoon the king’s grace with five of his privy chamber, being disguised with mottled cloaks with hoods so that they should not be recognised, came secretly to Rochester, and so went up into the chamber where the said Lady Anne was looking out of a window to see the bull-baiting which was going on in the courtyard, and suddenly he embraced and kissed her, and showed her a token which the King had sent her for New Year’s gift, and she being abashed and not knowing who it was thanked him and so he spoke with her. But she regarded him little, but always looked out the window… and when the King saw that she took so little notice of his coming he went into another chamber and took off his cloak and came in again in a coat of purple velvet. And when the lords and knights saw his grace they did reverence… and then her grace humbled herself lowly to the king’s majesty, and his grace saluted her again, and they talked together lovingly, and afterwards he took her by the hand and led her to another chamber where their graces amused themselves that night and on Friday until the afternoon. Despite Henry’s protestations and no solution to his request the marriage went ahead on 6th January 1540 at Greenwich Palace, presided over by Archbishop Cranmer. The couple then spent an unsuccessful wedding night together. Henry complained further about Anne in particular he described Anne as having bad odour and saggy breasts amongst other complaints, he also stated that Anne was unprepared for married life and what was expected of her on her wedding night. It was known that Henry reported to Cromwell ‘I liked her before not well, but now I like her much worse’. By 24th June 1540 Anne was commanded to leave the court and was moved to Richmond Palace, while Anne remained in the dark as to what was happening back at Greenwich Stephen Gardiner was investigating the pre-contract Anne had with the Duke of Lorraine’s son. On 6th July 1540 Anne was informed that Henry was worried that their marriage was not lawful and her consent was sought for the marriage to be investigated. Anne gave her consent probably fearful of her life if she did not. The marriage between Henry and Anne was declared invalid on 9th July 1540 due to three factors; Anne’s pre-contract with the Duke of Lorriane, Henry’s lack of consent to the marriage and the lack of consummation after the wedding. In exchange for a quick and easy annulment Henry granted Anne an income of £4000 a year, houses at Richmond Palace, Bletchingley and Lewes along with jewels, furniture, hangings as well as Hever Castle, the former home of Henry’s second wife, Anne Boleyn. Anne was also given the title of King’s sister and allowed to attend court. Although the marriage did not work out between the couple Henry and Anne would go on to have a good relationship when Henry married his fifth wife, Catherine Howard, Henry visited Anne to inform her personally of the marriage. 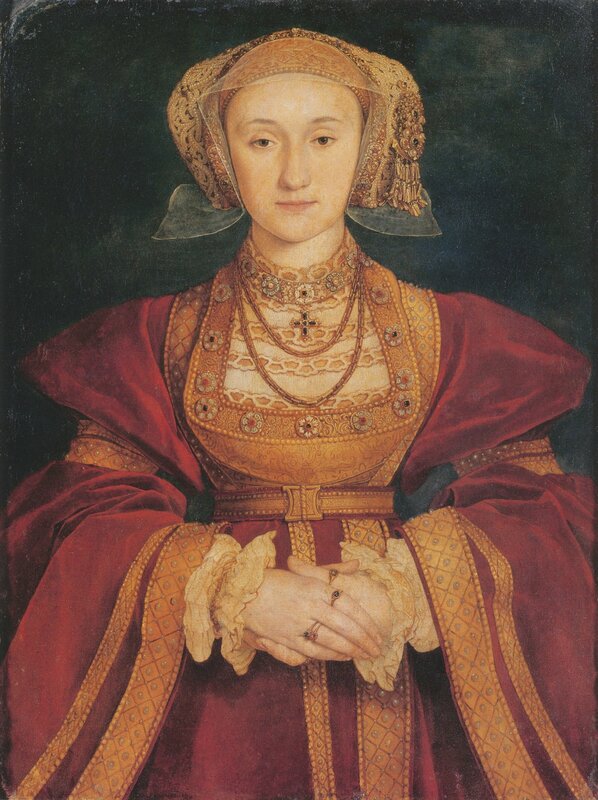 After the fall of Catherine Howard Anne’s brother, the Duke of Cleves, pushed her case for the King to remarry Anne, a suggestion that was quickly refused instead marrying Catherine Parr, a woman that Anne appeared to dislike. After King Henry VIII’s death Anne remained in England and in March 1547 the new King Edward VI’s Privy Council asked Anne to vacate her home at Bletchingley Palace and relocate to Penshurst Palace in order for Thomas Cawarden, the new Master of Revels to live in Bletchingley. Anne lived quietly away from court during Edward’s reign. When Edward’s eldest sister took the throne after his death Anne wrote to Mary on 4th August 1553 to congratulate her former step-daughter on her marriage to Philip of Spain. The following month on 28th September Anne accompanied Mary from St James’s Palace to Whitehall, Elizabeth also accompanied the pair. After falling under Mary’s suspicion Anne did not attend court again and chose to live quietly on her estates until her health began to deteriorate when Mary permitted Anne to relocate to Chelsea Old Manor, the former home of Henry’s final wife Catherine Parr. In July 1557 Anne dictated her final will, she remembers her family as well as the Princess Elizabeth, Duchess of Suffolk and Countess of Arundel. Anne also left money for her servants and asked Mary and Elizabeth to find employment for them within their households. 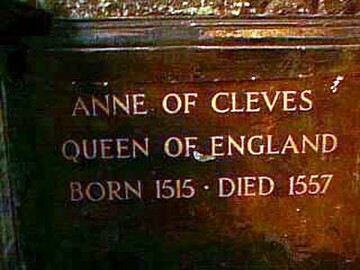 Anne died on 16th July 1557; aged 41, the cause of death is unconfirmed. Anne was buried in Westminster Abbey, the only one of Henry’s wives that was buried there. Her tomb is opposite the shrine for Edward the Confessor.